Mr Leppard, who spent £5,500 covering his body in leopard-like spots, was the world’s most tattooed man – a crown he held until recently. In his crumbling previous home, he cooked on a gas stove and slept on a bed made from blocks of polystyrene and foam. Tom Leppard – whose entire body is covered in leopard-spot tattoos – lived in a ruined bothy on the Scottish island of Skye for 20 years. He had a roof made from plastic sheeting, no electricity, no furniture and had to canoe three miles for his weekly shopping. 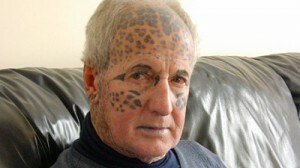 The Leopard Man shot to fame after becoming the world’s most tattooed man – a crown he held until recently.